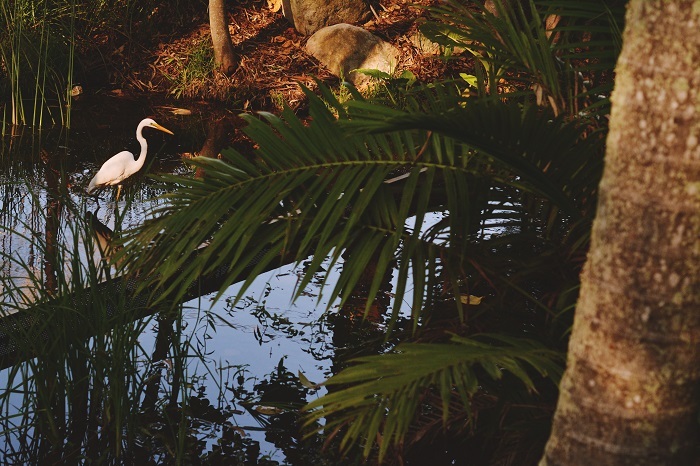 While the calendar may suggest that we are in the first month of autumn here, everyone in Brisbane has declared that we are currently experiencing our second summer. 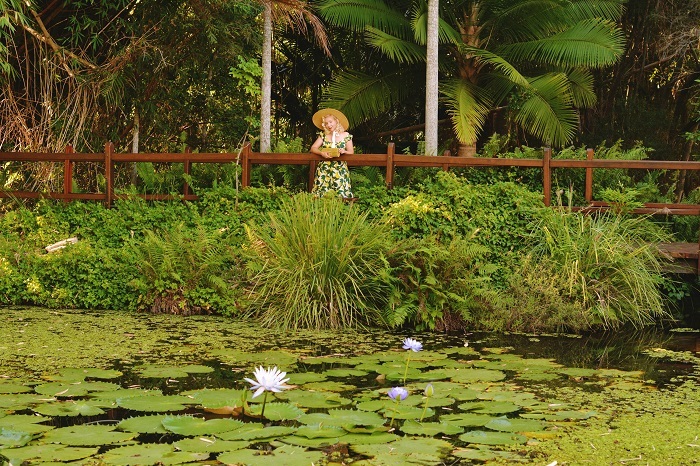 The weather has been absolutely tropical here – hot days that end with a bang in the form of thunder and lightning. As you can see from these photos, everything is looking very green and luscious at the moment! 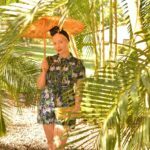 But it’s hard to be unhappy with the continuation of summer weather when Collectif Clothing goes and releases a fabulous S/S19 collection full of gorgeous tropical prints. 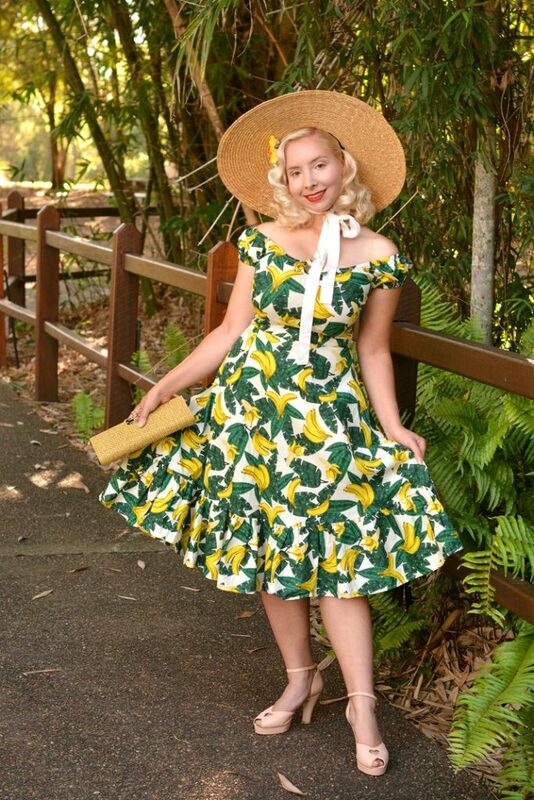 I have been wanting an outfit in a banana print like this for a while now and was excited to see Collectif release the Lorena dress in this wonderful and fresh summer print. 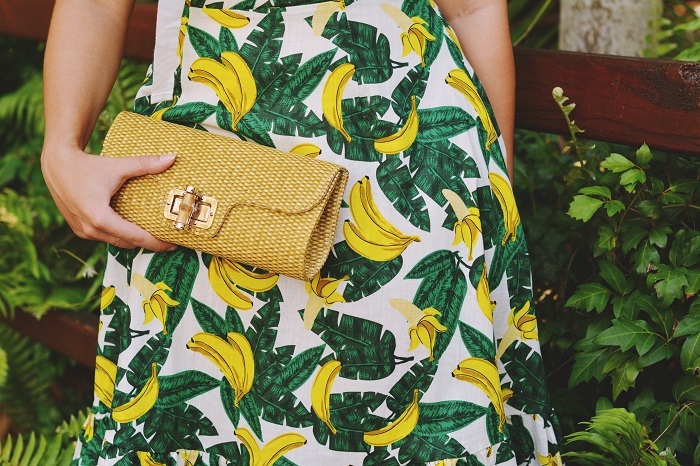 I love the vivid contrasting green and yellow, and since bananas grow in most peoples backyards here (although not mine sadly, instead we have a macadamia tree…) the print couldn’t be more appropriate. I don’t own any off the shoulder dresses so I decided to try something different to my usual style – and I actually really love it! I spend most of summer trying to avoid getting awkward tan lines on my shoulders so this dress is really just the thing for avoiding that. The kind of dress I would strongly advise taking with you on vacation to a place that’s hot and sunny! 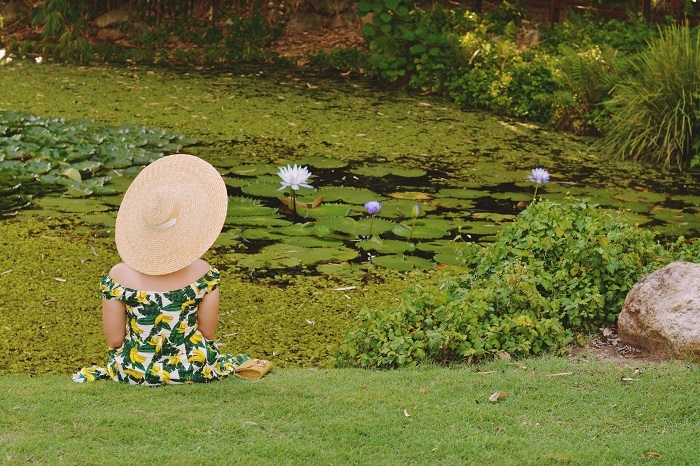 Wear it for a stroll along the beach or while reclining in a beach chair…banana daiquiri in hand… I should add that one reason I love wearing such a wide brimmed hat is that it’s a good way to keep your shoulders from getting scorched! I’m wearing the Lorena dress in my usual Collectif size, a 10 – and the fit is absolutely spot on. Comfortable and very flattering! This lovely clutch bag is the new Bamboo Clutch in the caramel shade and it is the perfect accessory for any tropical themed outfit. Which is exactly why I picked it – it’s very versatile and so easy to carry. Just the right size to fit a phone, cash/cards and compact! Not to mention very light at the same time – so if you’re trying to work out a holiday capsule wardrobe I would consider a bag like this an essential. 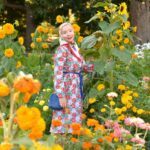 If you’re very into the matchy matchy look however, I also recommend checking out the Lulu Hun Jane bag which comes in the same print as the Lorena Banana Print Swing Dress! 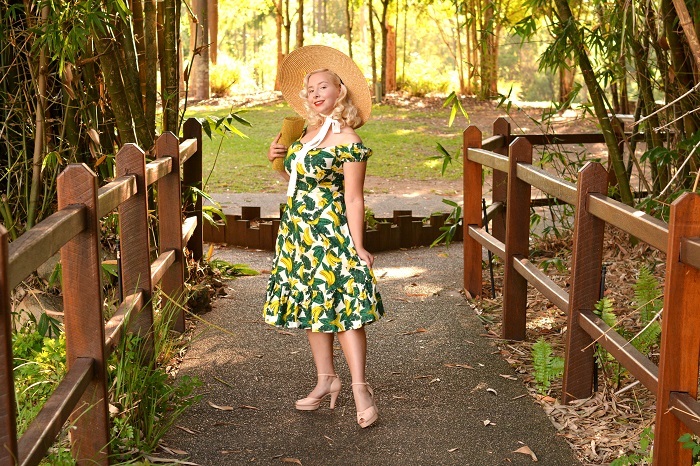 If however you’re looking for something a little more low key and find the vivid bananas a bit much, or prefer something with straps – check out the equally gorgeous Collectif Jade Banana Leaf dress! 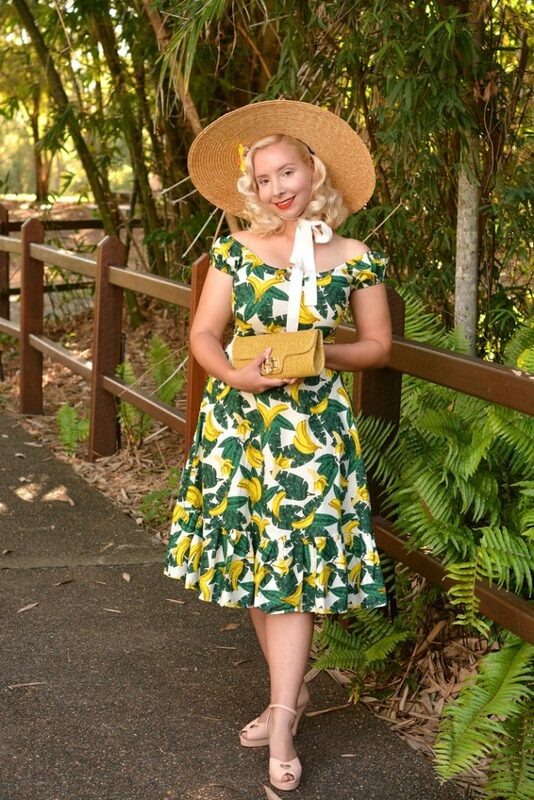 A vintage lover from Brisbane. I am passionately nostalgic for decades before my time. 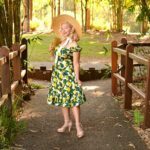 I enjoy recreating looks inspired by the past wearing both vintage and vintage reproduction clothing. 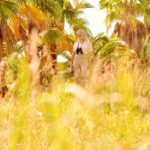 My blog focuses on the styles of the art deco period and features both authentic vintage pieces from the 1920s, 30s & 40s, as well as modern reproductions of clothing from these eras. 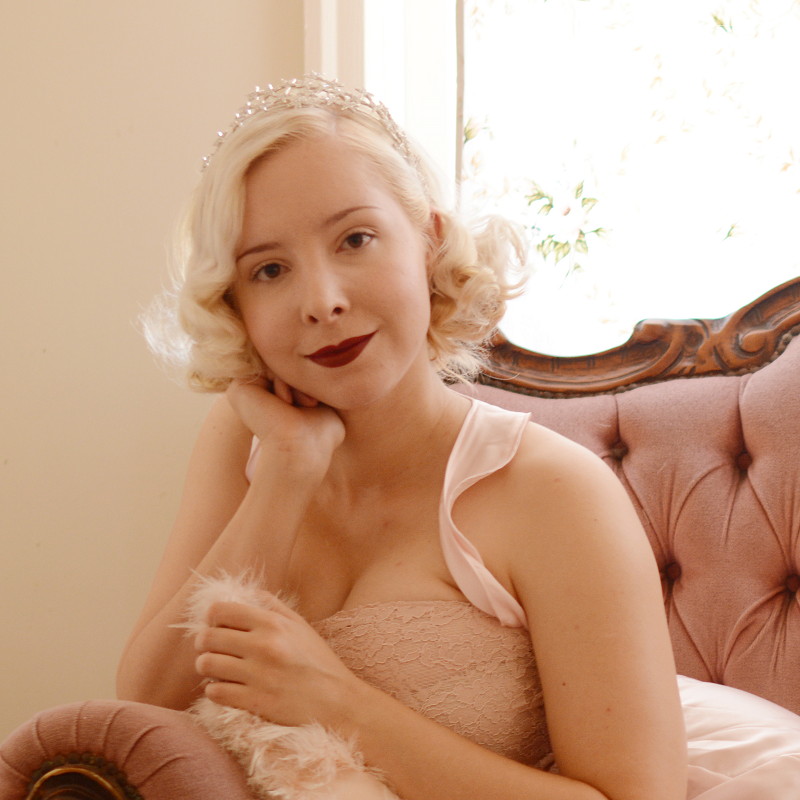 My blog explores creating modern every day looks with vintage elements. If you would like to say hello get in touch with me through harlow@harlowdarling.com.